At least five people, including an 11-year-old girl, were killed in the storms. 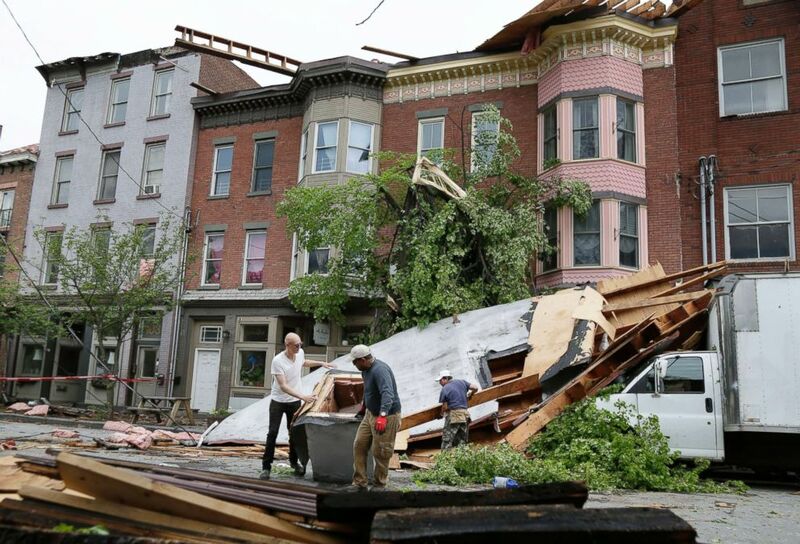 Four tornadoes ripped through Pennsylvania and upstate New York Tuesday night in a series of severe storms that pounded the Northeast. Residents are now left to pick up the pieces. 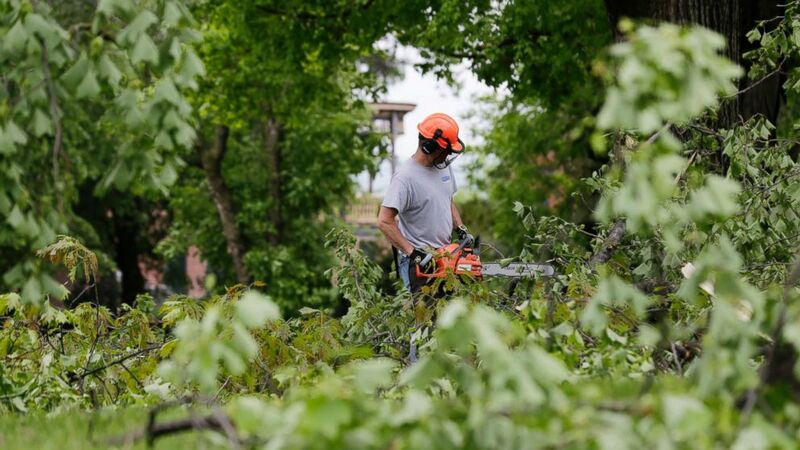 (Seth Wenig/AP) A man clears downed branches and debris on the grounds of Washington's Headquarters State Historic Site in Newburgh, N.Y., May 16, 2018. (Seth Wenig/AP) Men work to clear debris out of the street in Newburgh, N.Y., May 16, 2018. Powerful storms pounded the Northeast on Tuesday with torrential rain and marble-sized hail, leaving at least two people dead and hundreds of thousands of homes and businesses without power. At least five people, including an 11-year-old girl, were killed Tuesday by falling trees during the rough winds and rain. 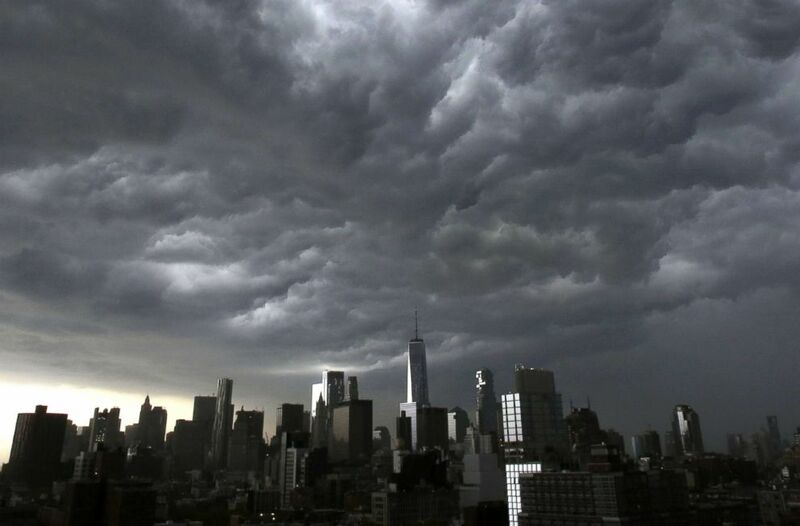 (John Angelillo/UPI/Newscom) Dark storm clouds move over One World Trade Center in lower Manhattan as a thunder storm moves through the New York City area, May 15, 2018. 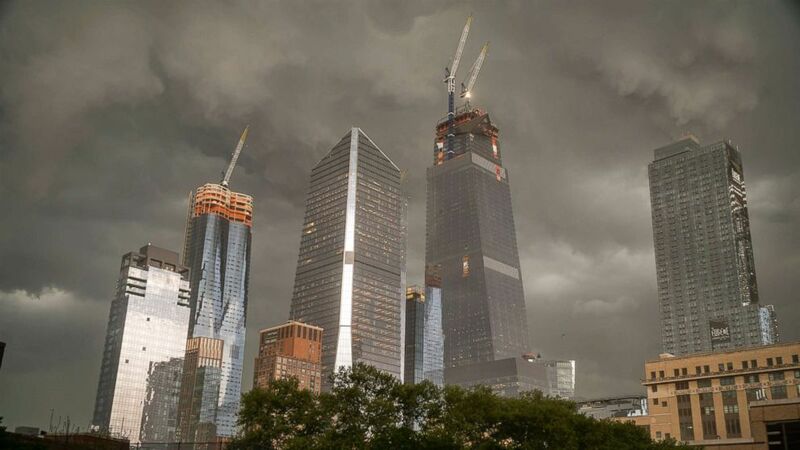 (Richard B. Levine/Newscom) The Hudson Yards development on the west side of Manhattan in New York is seen as a fast moving storm passes through the city, May 15, 2018. Over 300,000 customers were without power in the region this afternoon. In the town of Brookfield, Connecticut, every road has downed trees and wires, and 85 percent of customers were without power this afternoon. 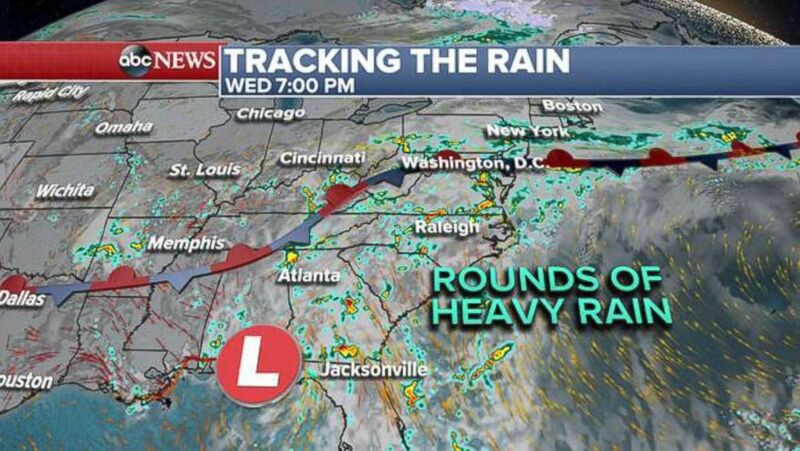 The severe weather is over, but rounds of heavy rain are expected to continue throughout the week from Florida to New York. (ABC News) Tracking the rain, Wednesday. 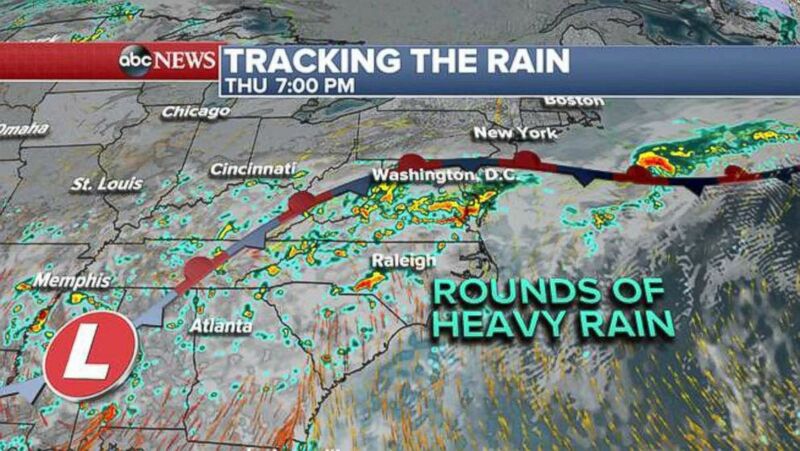 (ABC News) Tracking the rain, Thursday. 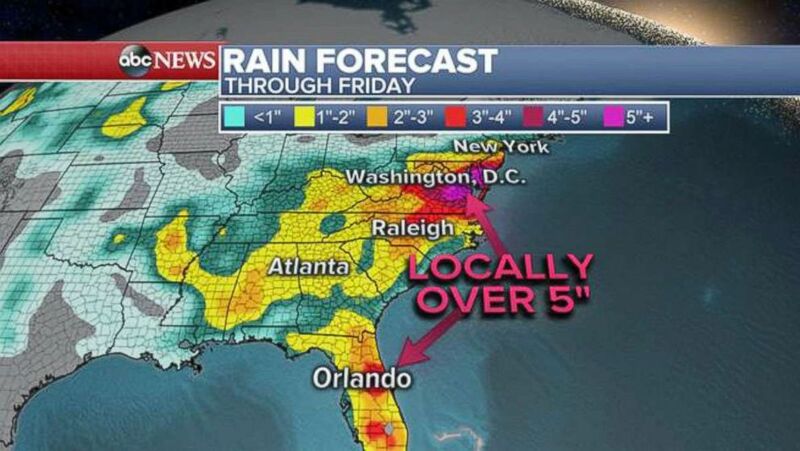 Isolated flooding is possible -- some spots in Florida and the Mid-Atlantic could see over 5 inches of rain. 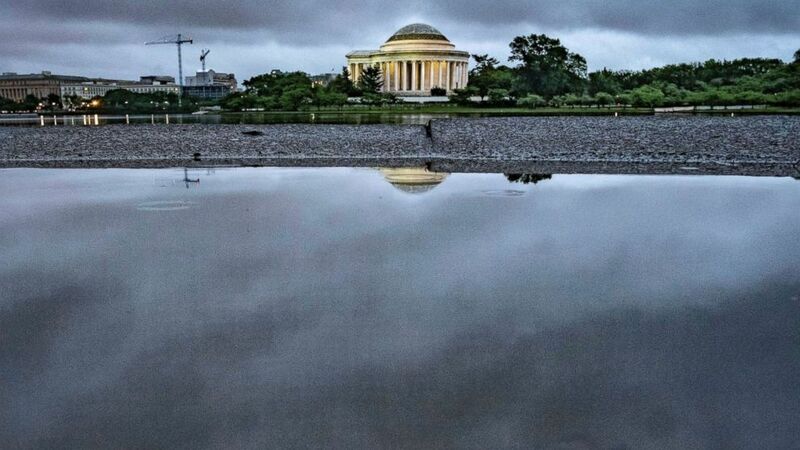 (J. David Ake/AP) Storm clouds are reflected in a puddle near the Jefferson Memorial in Washington, May 16, 2018. Rain and thunderstorms are expected to continue in the Nation's Capital area for the next couple of day.